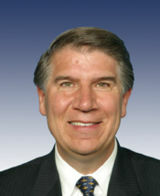 Our Campaigns - Candidate - Ernest J. Istook, Jr.
Name Ernest J. Istook, Jr.
Info Ernest was elected to the 103rd Congress on November 4, 1992, having come from a background of public service to his state and community, plus volunteer work in the private sector. Within Congress, Ernest has been a consistent hard worker as a member of the House Appropriations Committee. In 2001, he was named chairman of the Appropriations Subcommittee with jurisdiction over the White House, the Treasury (including the Internal Revenue Service) and many other key government agencies. Previously he served as the subcommittee chairman on the Appropriations Subcommittee for the District of Columbia. He was appointed to the D.C. Subcommittee chairmanship in 1999 and served though 2000, he remains a member of the D.C. Subcommittee, and he also serves as a member of the Appropriations Subcommittee on Labor, Health and Human Services and Education. Ernest also served as a Board Member of the Oklahoma City/County Library system from 1982 to 1986, and as its chairman. Prior to this, he served as Director of the Oklahoma Alcoholic Beverage Control Board during 1977-78, as well as Assistant Legal Counsel to then-Governor David Boren. Ernest was elected to the State legislature in 1986, and that same year became a Director of the Warr Acres Chamber of Commerce. His fellow Republicans chose him in 1988 to serve as Assistant Minority Leader. The Boy Scouts of America hold a special place in Ernest's heart, earned by their decades of building citizenship, character and fitness. He has served many years as a Scoutmaster, and both his sons are Eagle Scouts. He also has been active working with youth at church, and teaching Sunday School (usually to teens). Before entering public service, Ernest worked as a radio news reporter, covering the Oklahoma State Capitol. While working full-time, he attended law school at night. He then established his own law office, practicing law for 15 years until he was elected to Congress. Ernest was born on February 11, 1950, in Fort Worth, Texas, graduating with a B.A. in journalism from Baylor University in 1971. He received his J.D. degree from Oklahoma City University School of Law in 1976. He married the former Judy Lee Bills in 1973. They have five children: Ernest III ("Butch"), Chad, Amy, Diana and Emily. All five are currently in college; three are married. Ernest and Judy's first grandchild--Alyssa--was born in March, 2000.